This was a fun one to make but a hard one to try to decide what to put in the squares! LOL. For you inchie lovers this would be a good one as you can mat them and set them along the side (or bottom - depending on how you decide to finish the card.) 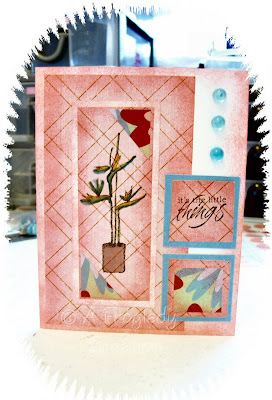 For the card I made though I just used and edged pieces of the patterned paper to fill in. I then cut a piece in half crosswise and edged again with Boudoir Ink to offset the corners in the larger rectangle. I stamped with my Palette Noir Ink the Sketched Flower from TAC Sketched Flowers T-2178 (sadly it is retired set) straight onto the patterned paper and then colored it with Copic Markers (YR23, BG05, E71 and YG63) This I matted onto some white card stock and then onto the top of the card front.. I used Boudoir Blush to edge all the papers on this one also. The sentiment I stamped is from TAC set It's the Little Things TA-2876 and was stamped with the Palette Noir Ink onto the patterned paper also.